At least ONE good reason to buy a PlayStation 3. 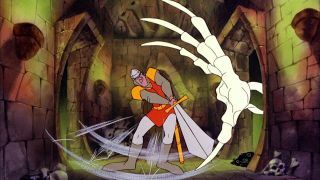 The Register reports: Dragon’s Lair, the now 24-year-old animated video game developed by one-time Disney animator Don Bluth for laserdisc players, is back, remastered for the HD era and now available to buy on Bluth-ray Disc - sorry, Blu-ray Disc. You will find a Dragons Lair history after the jump. 1982 (Early) Rick Dyer begins developing a game entitled Dragon’s Lair. He employs writers and storyboard artists to assemble a concept for Dirk the Daring, the Magic Castle, a dragon, and a beautiful princess. 1982 (October) Rick and Cinematronics’ president, Jim Pearce, approach Don Bluth Productions (Don Bluth/Gary Goldman) to become a partner in the creation of this historic laser disc game. 1983 (March) Dragon’s Lair is the hit of the Chicago Game Convention.